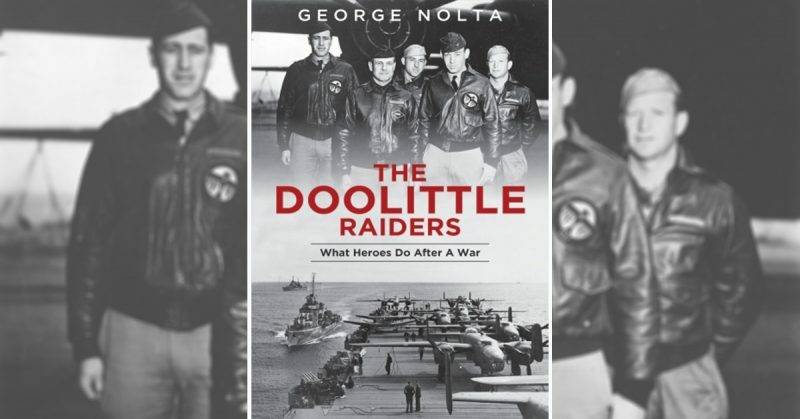 I’ve been sent this really useful book by George Nolta which gives us biographies of the aircrew who took part in the legendary Doolittle Raid of 18th April 1942 when sixteen B-25 Mitchell bombers flew from the USS Hornet to bomb Tokyo – the first air raid on the city. The author acknowledges that a great deal has already been written about this historic event, but he sets out to tell us something of the lives of the men who made their piece of history and he is correct when he points out that so much emphasis is on the raid itself that the aftermath is usually forgotten. Mr Nolta is indebted to the work of Ellen Lawson who spent over fifty years building an archive associated with the raiders. Her husband Ted had flown on the raid and wrote Thirty Seconds Over Tokyo, one of the first popular accounts of it that was also made into a movie. I will have to get myself a copy of his book. 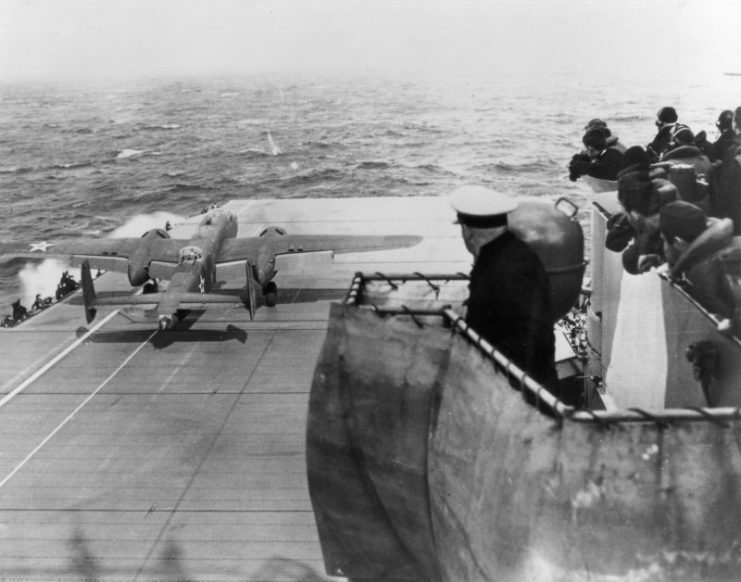 A U.S. Army Air Force North American B-25B Mitchell bomber taking off from the U.S. Navy aircraft carrier USS Hornet (CV-8) during the Doolittle Raid on 18 April 1942. 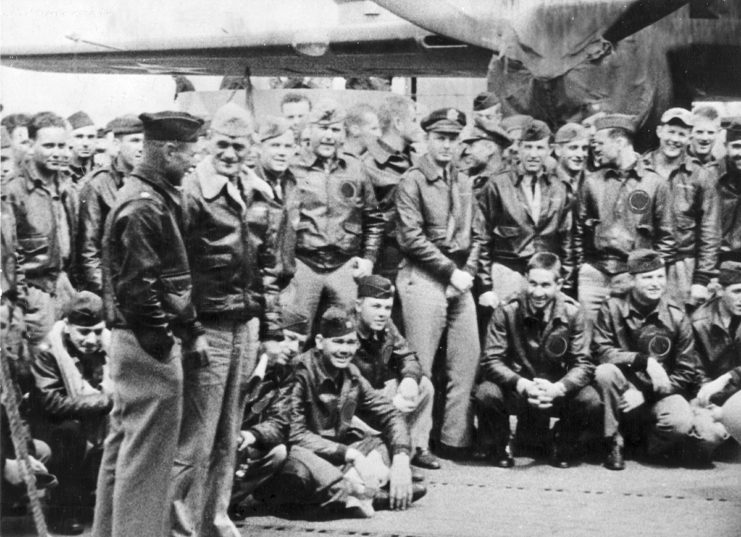 The book gives us a chapter dedicated to all sixteen crews made up of five men each – pilot, co-pilot, navigator, bombardier and flight engineer/gunner. 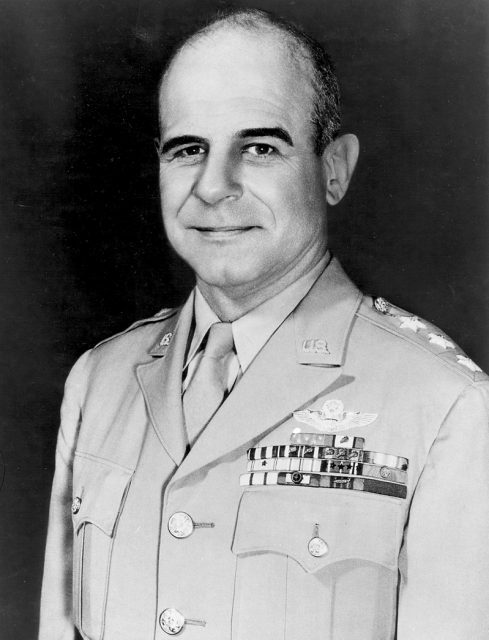 Some biographies are quite extensive – considering the careers of the likes of James Doolittle, himself, and the aforementioned Ted Lawson for example; while others are briefer. Three men died on the raid, while a further three captives were executed by the Japanese. A number of others died in captivity while others died later in the war. Happily, many of the others went on to live full lives and their stories draw comparison with the airmen who took part in the Dambusters Raid of 1943 in that their moment of much-publicized glory should be set in context with wider achievements. This is a really nice book based, in the main, on years of research and collecting of memorabilia by Ellen Lawson and, dare I say it; love for a group of men who brought a little bit of hope during the darkest of days of the war against Japan. No hyperbole is necessary to describe their achievement. Orders in hand, Navy Capt. Marc A. Mitscher, skipper of the USS Hornet, chats with Lt. Col. James Doolittle. It is well known the damage to Tokyo was minimal, but the impact on Japanese morale and also on their enemies was intense. The raid was a precursor of things to come for the Japanese, where their war of conquest and aggression was met with the full force of the industrial and military power of the United States and her allies. 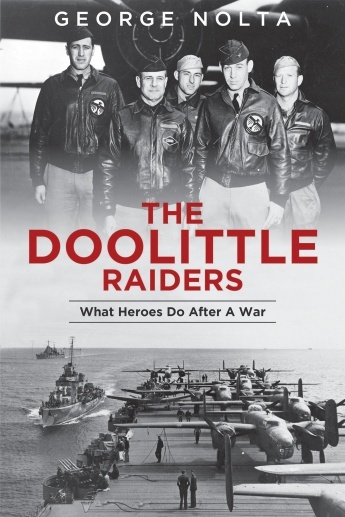 The book helps make the Doolittle Raiders more significant to us than their fifteen minutes – or perhaps even Ted Lawson’s thirty seconds of fame glory suggest; they were the sum of so much more. 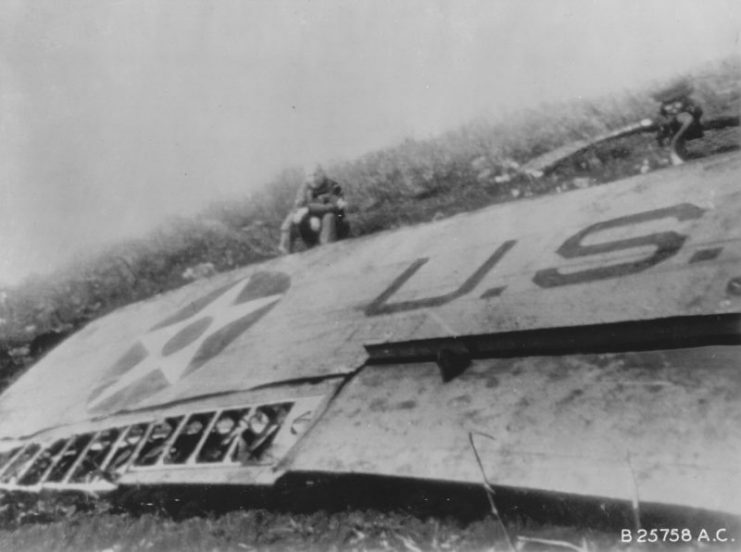 James Doolittle sitting by the wing of his wrecked B-25 Mitchell bomber, China, 18 April 1942. I like books like this because they fill in the blanks on the lives of people I much prefer to see in print than just on a webpage. 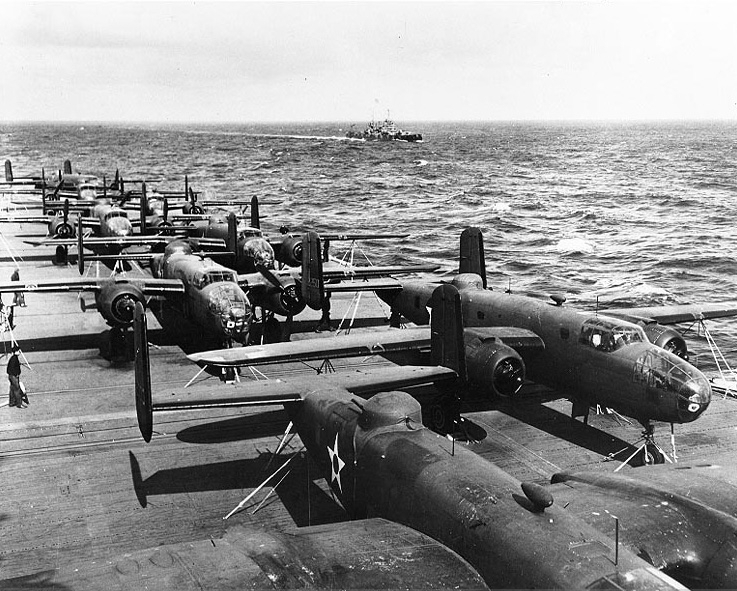 It has encouraged me to learn more about the Doolittle Raid and this is all to the good. Printed books have been making a comeback in the past year and Mr. Nolta is just one of many authors whose work illustrates why that is the case. Simple, well-produced books are always to be valued. I have no difficulty recommending this one.